Which GPUs does the instance have? What CPU? How many cores? How do I sign up and launch an instance? This video guide shows you how to sign up and launch, it also walks you through installing and hosting a Jupyter Notebook on your instance. 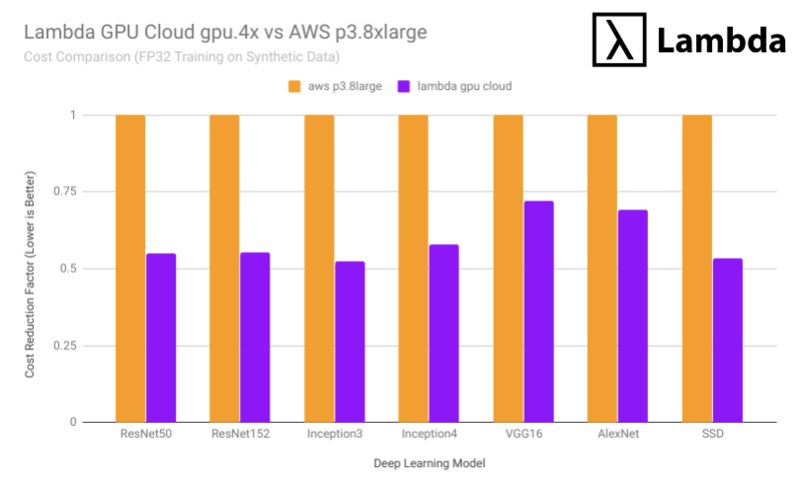 How does the Lambda gpu.4x compare with an Amazon p3 instance? This comparison chart shows about how much you'll save by switching from AWS p3.8xlarge instances to Lambda gpu.4x instances. For every $1 spent on AWS, you'll typically only spend about $0.50 with Lambda. How much do Lambda gpu.4x reserved instances cost? How fast is the instance-to-instance communication? Lambda instances are connected to each other via a 10GbE network connection allowing for good scaling properties. However, there may be times of high peer-to-peer traffic which may reduce measured performance. A dedicated 10GbE intranet connection speed is not included in our service agreement. 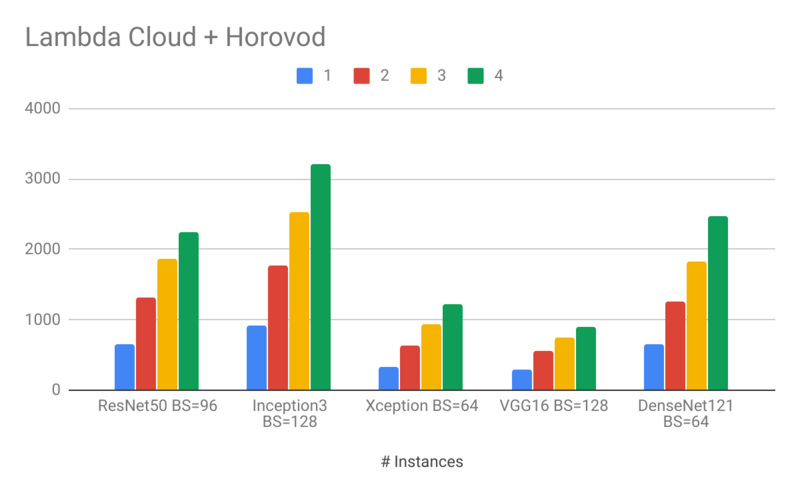 How well do the instances scale for multi-node training with Horovod? How do I shutdown / terminate the instance? What happens when I run `sudo shutdown`? NOTE: Running sudo shutdown on your instance will not cause your instance to stop being billed nor will it erase data. You can select the instance and hit "Restart" on the instance dashboard to start the instance back up if you accidentally shut it down via the terminal. You are still billed for instances that have been shut down via the sudo shutdown command because all of your data is preserved and the instance is still being occupied. Owhen you terminate the instance via the dashboard will it stop being billed. I'm new to SSH, how do I use this .pem private key? If this is your first time using a ssh key, you can follow this tutorial to get started. How do I upload and download models & data to my instances via the terminal? To copy files back and forth between your cloud instance and your local machine, use scp (secure copy). scp -i ~/.ssh/my-key.pem local_file ubuntu@96.76.203.255:~/. scp -i ~/.ssh/my-key.pem ubuntu@96.76.203.255:~/model.ckpt . When will I be billed for the instance time that I've used? Billing occurs either at the end of the month or when you have exceeded your credit balance with Lambda. In most cases you can expect to see a charge to your credit card once per month for an amount that will correspond with the amount you see on your Billing Dashboard. Spin up an instance now! Lambda Cloud GPU instances are ready to go out of the box so you can start coding TensorFlow and not fuss with Linux drivers.